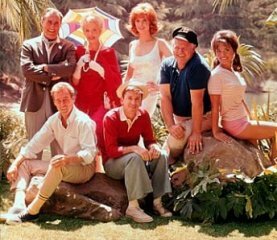 I had been looking forward to introducing my ten year old to Gilligan’s Island, and after watching the pilot (available on Amazon Prime), I now understand why this show manages to linger in my conscience long after its many contemporaries have faded away. This show echoes today among the various reality shows and in most ensemble comedies. What is Community, if not Gilligan’s Island transplanted and transmogrified. The appeal is in the crystallization of middle American archetypes of Kennedy-era America into a pantheon. If in an alternative reality, we worshipped a nature-based divinity with seven aspects, we would worship these “Six and One in One.” If you are honest with yourself, you may admit that you already do. The Six non-Gilligan castaways represent important aspects of the American psyche. The Skipper is the authority figure, having a presumed backstory as a veteran, but lapsed into a pudgy softness that is almost maternal -observe the moobs. He is in fact both parents who are equally ineffectual. The Millionaire is America’s 1%, ascotted, bilious, and lockjawed, he is married to Lovey, who represents America’s fading glory. The Professor is representative of America’s science and technology -he is the space program, modern medicine, and computers, but is sterile -his shirts are white, never soiled or bloodied. Mary Ann is the virginal Girl Next Door -pretty as a daisy, fresh as laundry line-drying on a summer day, and fertile as the Kansas soil that she hails from. Ginger is the encapsulation of American desire. Like Joan Harris née Holloway of Mad Men, she is not blond, but essentially a stand in for America’s fetish for blonds. Ginger is as obvious as an flesh-colored orchid. Mary Ann and Ginger could be a two-faced goddess that could be named Madonna-Whore. These all face off against the great demon Gilligan, who is trickster, destroyer, and adolescent priapism -he is the baby boomer in early adolescence ready to terrorize his parents and peers. If the censors had not been in the way, Gilligan’s Island in the second season would have seen Mary Ann and Ginger, both pregnant, foraging for clams while Gilligan sipped coconut juice from the Professor’s skull, using the Skipper as his living chair, wearing a vest made from the Millionaire. Lovey would have been the main course in the season one finale. There are no people of color on this show, but Gilligan’s shirt is red, which is a marker, a red flag. For along with being the trickster, destroyer, and phallus rampant, Gilligan is the Other. At best, he is the troublesome minority who amuses with minstrelsy, but at worst, he will come and take your women. And why would we worship at the altars of such as these? We already do, because each of these characters is a demographic group that consumes and drives the economy. Each of these characters has a store at the mall. Each of these characters has a magazine, a channel on cable, and political candidate shaped for them. When I tried to explain this to my 10 year old, he said this, “It’s a stupid tv show that makes no sense and is frustrating because of that idiot Gilligan.” Such an innocent. He has so much liberal arts education to learn!